The VFTU series are 'fire tube burner-generated' hot gas heated water bath vaporizers. Hot gas is generated by a burner system and circulated through heat exchangers heating water retained in a ballast tank to the required temperature; cryogen is vaporized through tube bundles by direct contact with hot water. Cryogenic plants are designed to recover more than 93+% ethane from the natural gas stream with no loss of heavier components. Cryogenic chilling is achieved by chilling the feed gas thru a turbo expander to cryogenic temperatures not possible with standard refrigeration plants. 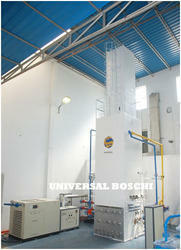 Furnaces are essential equipments and their productivity can swing economic fortunes of the company. At times there are many burners fitted over the length of a furnaces. Expertise in installation of Cryogenic Air Separation Units and LNG Regasification Units. Proven skills in installation of Cold Boxes and double-walled cryogenic storage tanks as well as cryogenic piping. MDS Air Products Pvt. Ltd.